Eggmazing is a new invention that makes it easy and fun to decorate eggs. 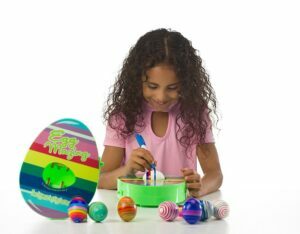 The Eggmazing Egg Decorator is a fast and mess-free way to decorate eggs. Just in time for the approach of Easter, the company recently released “The Bunny Edition” of the item which retails for $19.99. This floppy-eared version uses the same spinning action to create colorful designs on hard-boiled eggs. Everyone in the household will walk away with clean hands and a clean countertop! No messy dyes or unpleasant smells are the hallmark of these battery-operated decorators. 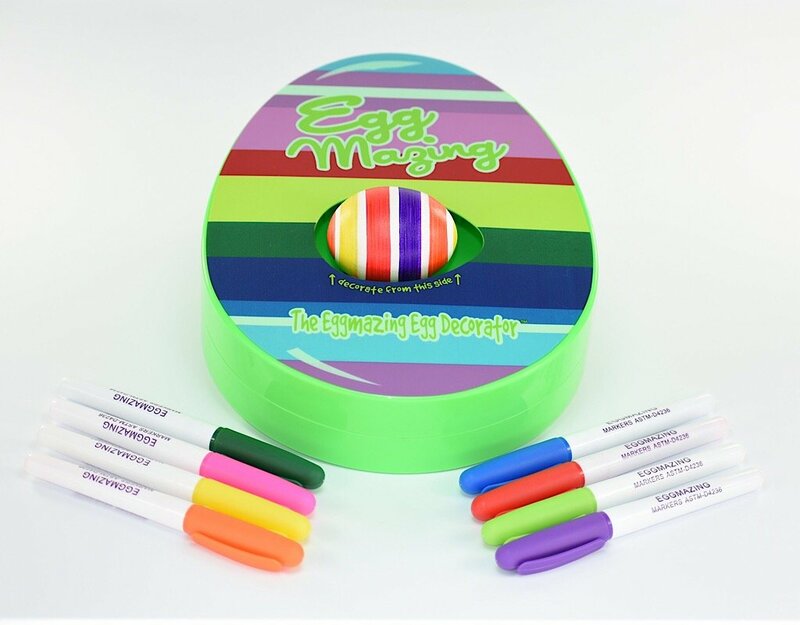 The original Eggmazing is packaged with eight colorful markers to design the most artistic eggs for the annual backyard hunt. Simply touch the markers to the spinning egg to easily and quickly create gorgeous eggs! Eggmazing is easy to use and mess-free. In just a year, over 5,000 neighborhood shops and big box retailers have stocked this affordable and adorable kit and this has spawned a Christmas decoration set and a dinosaur egg decoration set, too. Recently Scott Houdashell, inventor of The Eggmazing Egg Decorator, discussed the creation and release of this product via an exclusive interview. Meagan Meehan (MM): How did you get into designing—was the Eggmazing your very first invention? Scott Houdashell (SH): I have always enjoyed being creative and working with my hands. Woodworking has always been a hobby. One of the very first Eggmazing prototypes I made out of wood. The Eggmazing was not necessarily my first invention, but it is the first invention that we took to the manufacturing and to the public. MM: How did you initially come up with the idea for Eggmazing and how different was the prototype from the final products? SH: The idea came Easter 2015 while decorating with friends and family. The kiddos were already bored with the traditional methods of decorating and had gone back to their phones and video games. With a borrowed electric screwdriver, hot glue stick, spoon and marker… The first Eggmazing was born. Over 1000 hours and as many as 10 different prototypes later, our patented “Egg Lathe System” was found to be the most eggcellent way to spin and decorate an egg. MM: How long did it take to develop the concepts and what made you decide to go on “Shark Tank”? SH: A full year was spent on proving concept of idea. Once that obstacle was checked off the list, it took another full year vetting reputable manufacturers. 2015-2017. The decision to try out for “Shark Tank” was simple. Our motto was to leave “no egg left unturned.” If we were chosen to go on, then it was meant to be. MM: What was the whole “Shark Tank” experience like and how much did it help propel your product into the market? SH: The Shark Tank Eggsperience was overwhelming to say the least. Studio lights shining down, cameras all surrounding us and possibly Mr. Wonderful saying “You’re Egg to Me!” Oh, and did I mention I was in a bunny suit? This was our “one shot” on national television to convince The Sharks and the rest of the world that “we had built a better mouse trap”. MM: What sorts of responses have you gotten from fans? SH: We receive hundreds of great emails a week. Parents telling us how much they dread decorating with messy dyes and how much they love The Eggmazing! Our favorite messages are from families with children that have never been able to decorate before. We get heart felt messages from parents telling us this product has changed their kiddos’ lives. Children with sensory disorders, cerebral palsy & ADD are now able to decorate. We never thought it would take that path. MM: What prompted you to create the Follow up sets that involve dinosaurs and—excitingly—Christmas decorations? Just made sense that if you can spin an egg… you can spin an ornament. We are following up with The DinoMazing Egg Decorator. It will be available later this year and will be our year-round product. Dinosaurs are hot right now and it’s always fun to decorate eggs, even dinosaur eggs! MM: What stores do you sell the Eggmazing in and where do you hope to expand to soon? Party City and many grocery stores across the U.S. and Canada. MM: What experiences with the toy industry has been the most memorable and why? could sell enough product to pay for the trip, then we would be eggstatic. From the time the show started to finish, we were slinging eggs. Over 600 to be eggxact. Customers were standing in line to decorate and make their order. We sold over $250,000 of product at our first toy show. Success! Eggmazing is easy to use and produces beautiful results. MM: Overall, what are your biggest goals for the future of Eggmazing? SH: We want to make The Eggmazing Egg Decorator a household name. If you try it, you will love it! MM: Is there anything else that you would like to mention? To learn more, visit the official Eggmazing website.